As I continue in my quest to eat healthier, I am finding it more and more important to search out cookbooks that strike the balance between being easy to use (as I am no masterchef, unfortunately) and containing healthy recipes. When I received the opportunity to review The Secret Ingredient by Sally Bee, I wanted to see if this cookbook was going to meet my needs as a novice cook in search of a healthier lifestyle. The front of this book says that it contains “Delicious and easy, heart-healthy recipes that might just save your life” so it sounded like it could be exactly what I was looking for in a cookbook! The cookbook begins with Sally’s story – as a 36-year-old mother with 3 small children and an already-healthy lifestyle, her life changed abruptly when she had multiple heart attacks! Her experiences were the motivation for her to write her cookbook, with some portions of the cookbook explaining various elements of healthy eating and her own personal philosophy about choosing foods. Overall, I LOVED this cookbook! It is obvious that Sally is from England (both in her prologue and through her recipes it is quite obvious) and I appreciated the fact that, for the most part, her recipes could still be made in North America with little to no adaptation. The only section I think I would have to make major adaptations when using the recipes would be the section on fish because there are many fresh fish in England that are not as easily available in North America. That being said, it is also obvious that she has added elements to make it easier for cooks to use her recipes (for example, she has a few recipes that include “courgettes” but they have added in brackets that we call a courgette a “zucchini” so that readers are able to purchase the proper items). I also liked that Sally included, with each recipe, the designation “everyday” or “treat”. She explains in her book that most recipes are healthy enough to be eaten daily, but that a few items, while still healthy, should be consider “treats” and eaten on occasionally. I appreciated that fact as it does make it easier to know when trying to cook healthy meals. 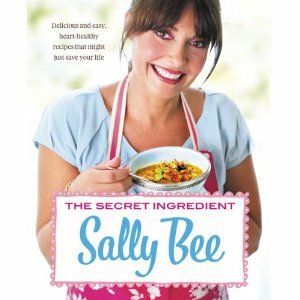 The only thing I would have liked for Sally to add to her cookbook would have been caloric and nutritional information. She explains, at the end of her cookbook, why she decided not to do so. While I understand her philosophy, I personally would have appreciated having that information. Overall, I would highly recommend this cookbook! The recipes are easy to follow, are healthy in nature, cover all different types of foods and, most importantly, are TASTY! I will be keeping The Secret Ingredient at the front of my cupboard to use regularly because I love it! What a great review! My daughter is always looking for ‘healthy recipe’ cookbooks – this sounds like one to recommend!